You’re ready to buy a new home, and the list of things you need to pay attention to is long. When you’re visiting the home, don’t forget to look at the HVAC system. Though it isn’t the first thing you notice when you walk through the doors, an old or broken HVAC system can cost you thousands of dollars in repairs or replacements after you move in. Save yourself the extra cost by making sure it’s in good order before you buy. The heat exchange process that happens in an HVAC system creates condensation. When the machine is running well and in good repair, that condensation does not leak from the machine or damage your walls. But if your indoor AC unit is leaking onto your drywall or leaves puddles that stand for long periods, this becomes an issue. Standing water creates humidity, which mold loves. Mold spores are a big source of respiratory distress and asthma problems in older homes, so inspect an HVAC system for any leaks. When a furnace has had proper maintenance, you don’t have to worry about carbon monoxide. If you ask a furnace to run year after year without tune-ups, it might develop problems that release carbon monoxide into your home. This isn’t a problem you want to discover the first time you turn on your heat in the winter, because carbon monoxide is extremely dangerous to humans when breathed in, especially over extended periods. Have a furnace repair technician examine the furnace in the home you want to buy. The ducts you can see might be in good repair, but the ducts within crawl spaces and hidden in the ceiling might not be. 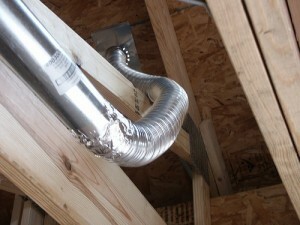 Holes in ductwork account for significant energy loss. They also cause indoor air problems, because they’re access points for debris and particulates to enter the stream of air and get blown throughout the house. Ask to go into the attic, basement, or crawl space, and take a flashlight to the ducts. Even if they seem OK to you, look out for any patchy repair jobs and streaks of dirt on the walls near the ducts. You should be able to find out how old the system is from the previous homeowners. If they don’t know, that’s not a good sign, because it means nobody replaced the HVAC system the entire time they were there. Other ways to tell a system is old include seeing rust spots and hearing loud sounds coming from the outdoor unit. You can always call your own HVAC contractor to examine the system, tell you how well it’s running, and warn you if any costly repairs are on the horizon. There’s nothing wrong with getting your own HVAC inspection if you think something’s up with the current system. The homeowners should be able to document yearly maintenance. If they can’t, look into it yourself so the system doesn’t quit on you right after you move in.